The Monkey Island series from LucasArts dates back to 1990. The latest iteration, a LucasArts collaboration with Telltale Games, is entitled Tales of Monkey Island, and it’s a massively sprawling and frequently amusing game. Tales of Monkey Island is broken up into 5 episodes, each with unique adventures. 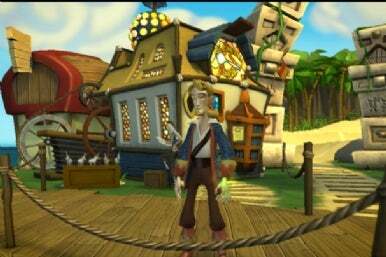 After a Windows and WiiWare release back in July 2009, Monkey Island was released for the Mac in February of this year. In case you’re not familiar with the Monkey Island series, here’s a quick primer: In a world distinctly reminiscent of Pirates of the Caribbean (the ride, not the Johnny Depp swashbuckling adventures), you’re cast as Guybrush Threepwood, a well-meaning if often flustered pirate. His nemesis is a zombie pirate named LeChuck, and the woman for whom he pines is Elaine Marley. 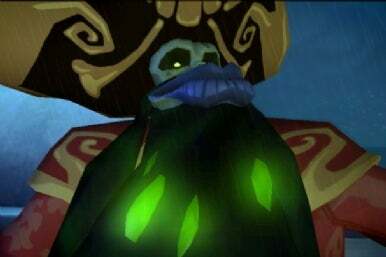 In Tales of Monkey Island, Threepwood unintentionally spreads LeChuck’s “voodoo pox”—essentially, the virus that causes zombieism. If that sounds ridiculous, it’s meant to. Monkey Island is characterized by a few ever-present traits, and one of them is a delightful sense of humor. The game is a beautifully drawn graphic adventure, but it plays more like an interactive movie; the dialogue, challenges, and storyline are all comedic and as important to your enjoyment as the gameplay itself. The cut-scenes (and there are many of them) and the gameplay itself feature a lush, 3D look, and my MacBook Pro was able to handle it all without stuttering. You can control Threepwood using either your mouse—by clicking and dragging in the direction you want him to go—or the keyboard. I found the mouse controls unsatisfying overall, instead I relied on the keyboard with occasional clicks on the specific object I wanted Threepwood to focus on. When the first episode (“Launch of the Screaming Narwhal”) begins, it opens with a prelude of sorts: Threepwood needs to (once again) rescue Elaine from the clutches of evil LeChuck. To do so, you quickly learn, Threepwood must dip his cutlass in fizzy root beer—which, of course, requires finding some root beer. That’s how you’ll get your introduction to several key elements of Monkey Island’s gameplay: you need to find objects to add to your inventory, interact with other objects using your inventory, and occasionally combine various items you hold (like, say, flat root beer and breath mints, or plant roots, a barrel of grog, and those same breath mints when you spill your first batch) to create something new. The game quickly thrusts you into creepy Flotsam Island. You can explore the 3D world at your leisure and interact with the numerous characters that inhabit the island as you see fit. The world is big enough to provide plenty of interesting scenery and interaction points, without becoming so mammoth that you constantly need to check in with a map. Each episode is filled with mini-adventures, and some adventures are more puzzling than others. When you realize you need a card to enter the dingy Club 41, finding the pirate who’s lost his access card, and then finding the card itself (spoiler alert: check the clothes drying on the line), isn’t difficult so much as it is time-consuming. When you encounter the pirate who wants a specific ninja action figure to complete his collection, however, figuring out the multi-step intricate process of creating it and then hiding it is both difficult and time-consuming. Luckily, even as you slowly cross wide expanses of Flotsam Island numerous times, between the game’s energetic soundtrack and charming visuals, it’s rarely dull. It certainly helps matters that the goals you’re working to achieve—inciting a bar brawl, or learning how to imitate scary faces from the folks you encounter so that you can later win a “face-off”—are highly entertaining in their own right. You can find plenty of walkthroughs online to guide you through some of the game’s more complicated challenges, and I’m not ashamed to admit that I occasionally needed to resort to just that. Admittedly, though, merely following someone else’s instructions to get through Tales of Monkey Island is far less fun than exploring it yourself; figuring out these puzzles is the game. Several key elements of the Monkey Island series helped me shun the walkthroughs more and more as I got more comfortable with the game. First, the gameplay is pretty forgiving; you can’t really screw up. You can take a long, long time to achieve a goal, and you can expose yourself to danger repeatedly—but Threepwood survives. If you miss a clue, it’s always available for you to spot later. And patience is rewarded, too. When the game notices that you’re taking a long time, or having the same conversations with characters over and over again, subtle hints (whose frequency can be customized) appear. The camera might pull back to reveal a discarded miniature sword you hadn’t noticed, or a character may suddenly offer some new, more direct advice. I turned the hints up to maximum frequency, because I decided that if I got stuck, I’d rather get help from the game itself than from Google. Effectively, you dictate the pace of the game. Monkey Island veterans (or walkthrough-addicts) might be able to run through an episode in two hours or less. If you rely only on yourself and the in-game hints, each episode could take at least twice as long. Tales of Monkey Island’s core ingredients are all strong: The visuals are excellent, the voice actors superb, the soundtrack delightful and the gameplay is certainly fun. You will inevitably hit frustration points along the way when you can’t quite figure out what to do next, but it’s hard to stay miffed for long with so much fun stuff going on. Given the nature of the game, once you’ve completed each episode, it’s not too likely that you’d want to replay it again later. But $35 for 10 to 20 hours of fun strikes me as well worth the price of admission. Tales of Monkey Island requires OS X 10.5 or newer, and an Intel Core 2 Duo processor.